Mexican revolution, California migrant workers and migrant camps, farm workers’ strikes. Pam Ryan was inspired to write Esperanza Rising by her grandmother’s childhood experiences. 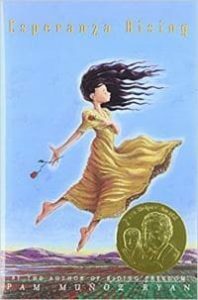 Although it was written in 2000, Esperanza Rising is still extremely popular and part of many school curriculums. Esperanza Ortega (13) is the doted on daughter of a wealthy rancher. She lives in luxury with servants to help in the house and many workers who help in the vineyards. Secure within her close-knit family, she is blind to the hardships of those surrounding her, including her closest friend Miguel, the son of one of her father’s workers. Then, in an instant, Esperanza’s life falls apart. Her father is murdered and her mother’s well-being is threatened by her father’s step-brother. 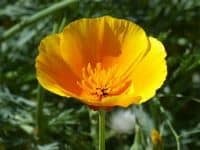 Their only chance is to flee Mexico penniless with their former servants and try to rebuild their lives by working in California. Once in the U.S. they find life very difficult; the U.S. is in a depression and unemployment is high. Esperanza will need to become self-reliant. She will need to learn to think and act for herself. She will need to learn how to work hard to help herself, her mother, her friends and her community of other migrant workers.